There came a day I realized I could not keep going the way things were. I could not keep sucking it up and continuing on. I just could not do the job I had been given to do that day. That was the day I first learned about asking for help. It was a Sunday morning. I woke up and did not want to get out of bed. 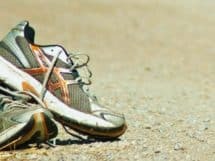 It wasn’t just a physical issue, although my body did feel like an unresponsive bag of wet sand; it was mostly a mental issue. I just did not want to do life. My husband had gotten a new job in another state, and we were waiting for our house to sell. We had three girls, ages 4, 2, and just 1. He would fly away on one of his company’s airplanes to his new job for four days each week and fly back home for his three days off. We had been doing this routine for about three months, with no end in sight. Until we sold our house, this was life. This particular Sunday morning was one of the days he was gone. My usual job on a typical Sunday was to get the girls up and get us all ready for church. I loved going to church most weeks, but on this morning I just did. not. want to go. I was mentally, emotionally, and physically exhausted. But the harsh truth was that I also did not want to stay home — because that would mean taking care of my small children. That would mean noise, and conversation, and messes. That would mean physical and mental effort. I didn’t feel able to handle any of that. All I wanted to do was lie down and cry. I was stuck. I couldn’t figure out how to handle this situation. I’d always been the self-sufficient and capable one, the one who could handle anything, even with my husband 1500 miles away. All I knew was that this time I just couldn’t do it. Whatever “it” was. It just wasn’t gonna happen. 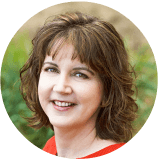 My good friend Diane did NOT wait — she called right back, assessed the situation (I remember wailing something like, “I just don’t want to do this anymore,” which probably gave her a big clue), and informed me that she would be over as soon as she could. Within a relatively short time she was at my house picking up my girls to take them to church. 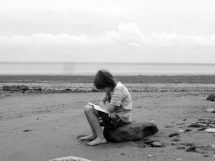 I was given the blessed relief of a morning (and most of the afternoon, it turned out) at home BY MYSELF in which to rest, cry, read, pray — whatever it took to get me back on my feet. Wow, had I needed that. But I did not know how to get it — until I fell apart. Until someone saw my need and took charge of the situation. Until I was overwhelmed enough that I was willing to admit that I could not go on without help. 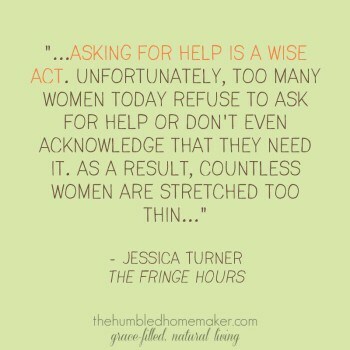 Ladies, asking for help should not be the terrible thing that we seem to think it is. 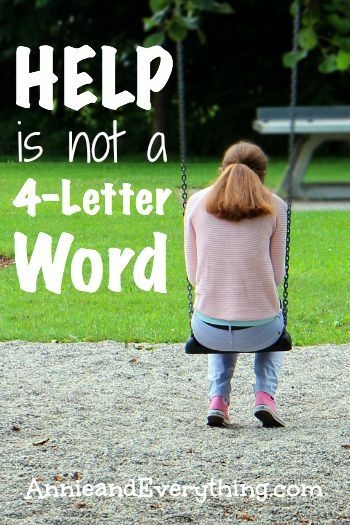 “Help” should not be considered a four-letter word. You’d think I would have learned my lesson then, but I didn’t, really. We eventually sold our house and moved. 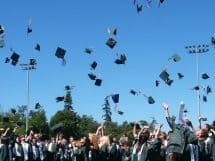 The Man became a seminary student — during which time we added two more children and began homeschooling the older ones — and during those years I hid my struggles. I thought that the wife of a pastor-to-be shouldn’t show any inadequacy, because everyone should see her, and her marriage, and her husband, as examples to follow. And guess what? Because I was unwilling to ask for help with my difficulties, things went from so-so to bad to worse. Again, it took a MAJOR melt-down for me to realize that I couldn’t do it on my own. My marriage was shaky, I was an emotional wreck; and I couldn’t keep up the charade any longer. Again, I reached out in desperation. And again, good friends came alongside us as counselors and helpers with the practical things of life. And I finally really learned the value of transparency, of admitting struggle and failure, of seeking help BEFORE the world caved in. Why are we women so ashamed of needing help? Why do we think we have to pull up our bra straps and muscle on, when inside we are dying? Why are we so protective of the way others view us? Wanting others to see us as wonderful, perfect, having it all together in everything we do? What the quote says is exactly right. We stretch ourselves way too thin in our efforts to appear as if we’ve got it all under control. We are afraid that if we ask for help we will appear to be inadequate or imperfect. As a result, we probably need MORE help than if we’d swallowed our pride and asked for it back when we first started to struggle. This is a Pinterest world we live in, an online theater where everyone parades their “perfect” lives on stage for all to see. What we don’t see are the insecurities and the imperfections and the messes and the ugliness and the sorrow and the struggles. But they are there all the same. EVERYONE is a hot mess, y’all. Some are just more transparent about it than others. I have come to the conclusion that the transparent ones are actually lower on the “mess” scale than those that are parading perfection. Asking for help and receiving it, not just providing it, hello, creates a strength that can only be gained from mutually-giving relationships. It breeds a depth of friendship that doesn’t happen when you don’t let anyone see your “dark side.” Inviting others into your insecurities encourages a humility that is forthright and winsome. It reveals a generosity of heart, in that we allow others to minister to us, thus enriching their own sense of being needed. I think asking for help is actually a sign of maturity. It is emotionally intelligent to realize that you never will be perfect and it’s silly to try to make people think you are. Being transparent about our struggles shows that we are comfortable with ourselves and our foibles. It reflects that we are not as concerned about what others think of us as we are about learning what we need to change in order to do a better job. And it prevents the crash and burn scenario that is pretty much inevitable otherwise. Quote image used with permission from Erin at The Humbled Homemaker. I’m linking up today at the iHomeschool Network — the gals are all posting about “The Day I Realized I Didn’t Have it All Together.” Click on the image at the left to head over there for a big dose of encouragement!! I’ve decided I can’t really be friends with someone that acts like they have it all together. I’m finding it hard to make friends in a new community. I know I’m comparing my insides to their outsides, but unless they open up that’s what is going to happen. If I offer anything, I get “Don’t worry about us, we’ll figure it out. You have _____ to deal with.” Yes, I do but sometimes I get so stuck on my circumstances that helping someone out lightens my load a bit and I like to help. Goodness I hate feeling all alone in my struggles! Thanks for being transparent and not glossing it over. I know how you feel, Mamabug! “Comparing my insides to their outsides”– what a great way to put it. Making friends can be hard for that very reason. Let’s all just admit we’re idiots, shall we? 🙂 Then the process can go that much faster!! Great post! Gonna share it. As a pastor wife, I think we live in a world where we don’t naturally SEE the need to help that other person. We are all so “busy” with our own lives that we aren’t really BONDING anymore. I think of shows like Andy Griffith where they sit on the porch in the evenings and talk to neighbors. I don’t see that happening anymore in our go-go-go world. Do we really know our neighbors anymore? Yes, that is a great perpsective, Trena! People won’t feel comfortable asking for help if we don’t make it clear we are HAPPY to come alongside. I have been guilty of “let me know if you need anything.” But it’s a cop-out.